During the summer of 1984, Walt Padgett bicycled and camped Japan's Tokaido, documenting the famous "53 Stations of the Tokaido" prints of Ando Hiroshige and Junichiro Sekino. Since that time Mr. Padgett has been producing his own series of woodblock prints from his travels on this historic highway. The Tokaido, literally the "eastern sea route" stretching 320 miles, has provided the main link between the cities of Kyoto and Edo (Tokyo) for a thousand years. Although many Japanese artists have produced work drawn from the Tokaido, its landscape, its people, its history, still provide a rich source of subject matter, especially to the foreign eye of an American. Mr. Padgett utilizes authentic Japanese handmade chisels, brushes, and paper, in the manufacture of his prints; the blocks are hand-carved, the prints hand-burnished by the artist, in the sosaku hanga tradition. Ejiri lies across Shimizu Bay from Okitsu, home of the Japanese inn made famous by Oliver Statler's novel. 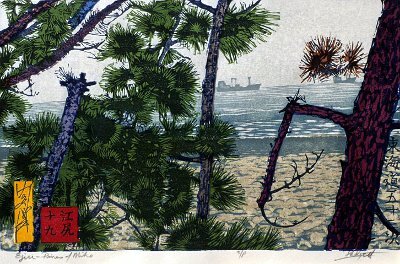 The legendary pines of Miho now witness freighters entering and leaving the bay. Ejiri is the 19th station of the Tokaido.